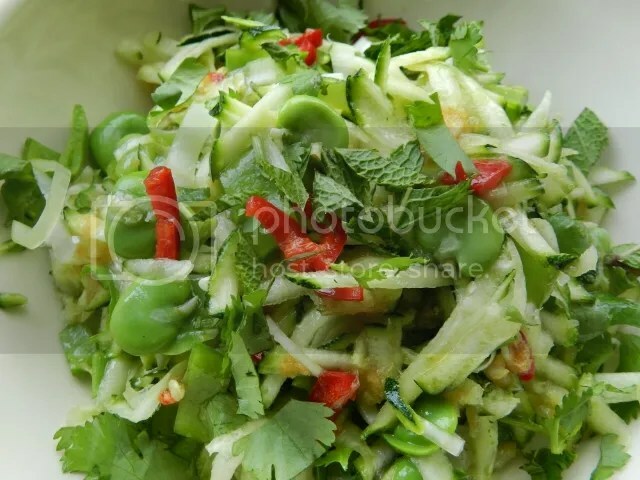 This used to be one of my mainstay recipes – something hearty enough to have as a main course with mashed potato or good bread, or as a vegetable side dish if you’re feeding the 5,000. I have a feeling the original recipe comes from St Delia, but it’s based on a French tian. 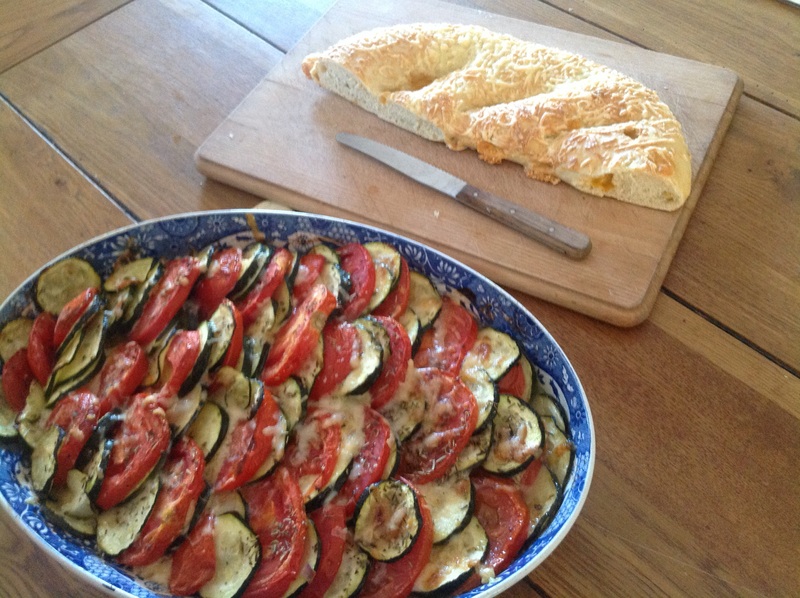 So it was appropriate dish to make for friends on a holiday in France. It was dressed up with pig products for the meat eaters, and also served with a very good cheese bread. And it’s easy enough to make it vegan by leaving out all the cheese. Chop the onion and garlic and soften in a couple of tablespoons of olive oil. Spread in the base of a large oven-proof dish. Slice courgettes thinly and fry for a couple of minutes in the garlicky oil to soften them slightly. Slice the tomatoes and cheese thinly. Arrange alternate upright rows of courgette, tomatoes and cheese so it looks kind of like roofing tiles. Season with salt, black pepper and mixed herbs. Sprinkle over the veggie Parmesan. Cook in a medium oven for about 15 or 20 minutes until the tomatoes and courgettes have softened, the layers of cheese have melted and the veggie Parmesan layer has gone slightly crispy. I’m under the weather at the moment and sorely in need of comfort food. Pasta and various toppings has been OK, but I had an urge the other night for ratatouille and baked potato. 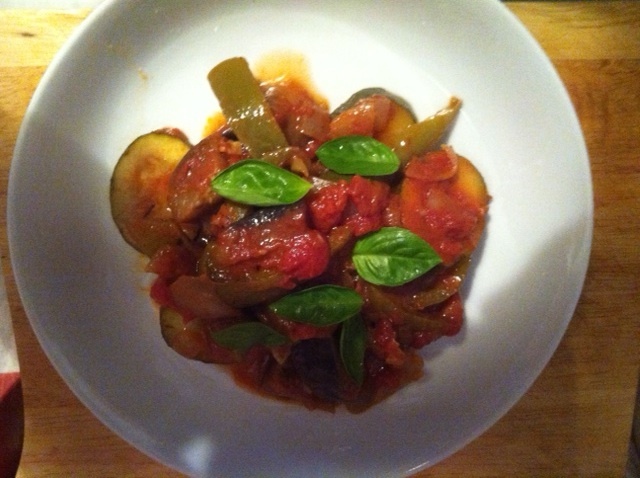 I think I’ve spent 20-whatever years searching for the perfect ratatouille recipe. On the face of it, it should be simple – it’s a vegetable stew, after all. But it’s dead easy for it to tip over from perfect texture to mushy mess. I used to bung everything in together and let it cook, but that’s a sure-fire route to crunchy courgette, leathery aubergine and soggy onion. 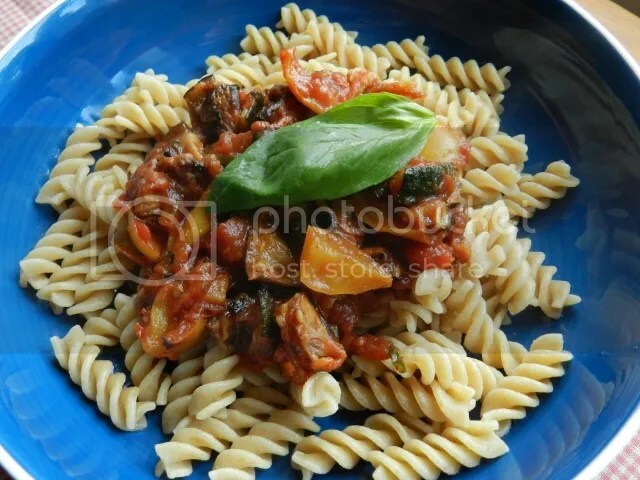 I then tried a suggestion from one of the TV chefs (forget which one), where all the ingredients are cooked separately and then mixed together with the tomato for the final few minutes. Sod that for a game of soldiers – all it produced was a mountain of washing up and a bland dish, as the flavours never seemed to meld. And I think it’s St Delia who has a baked ratatouille – it’s OK, but, but … This is a stew we’re talking about. So now I fry the aubergine, courgettes and peppers together for about 15 minutes, then add the onions, garlic and tomatoes, and cook on a low heat for 30-40 minutes. Trial and error has discovered that a blander oil is best. I’d usually use olive oil for everything, but it tends to overpower the vegetables. Sunflower oil is fine. I add the seasoning at the end and then allow it all to stand for 15-20 minutes. This is a dish that I prefer not to be piping hot. In fact, it’s as good cold the next day (although it re-heats fine) piled on a baked potato, or served with good crusty bread to mop up the tasty juices. Chop the aubergine, courgette and peppers into bite-sized chunks or slices, as takes your fancy. I tend to cube the aubergine, do slices of courgette and strips of pepper for variety. Fry on a medium heat for 15 minutes. Add the onion, garlic and tomatoes/passata and mix thoroughly. Cook on a low heat for about 30 minutes and then check whether the vegetables are done. I prefer stuff under-cooked, but you might want to give it an extra few minutes if you like your vegetables less crunchy. Add a generous shake of mixed herbs, sea salt and black pepper. I also add a teaspoon of brown sugar which, I think, reduces the acidity in the tomatoes. If you don’t like using dried herbs (and I think they’re fine here), experiment with whichever fresh ones you prefer. But this is a rustic dish and it needs strong seasoning. I then take the pan off the heat, cover it and leave it for about 15 minutes. I think you get a better idea of the flavours when this dish isn’t super-duper hot. If you eat cheese, some grated cheddar on the top is good. Otherwise, parsley or basil is good for a garnish. Serve with baked potato or crusty bread. This is a spring soup, in lieu of spring weather. This is very quick and simple to make, but tastes like you’ve spent ages on it. It’s also one of the best uses for the fairly bland courgette. Courgettes are not my favourite vegetable, but they add a wonderful texture to soups when they’re blended. This soup is also fat-free for those who care about that kind of thing. Put the soup ingredients in a saucepan and bring to a simmer. 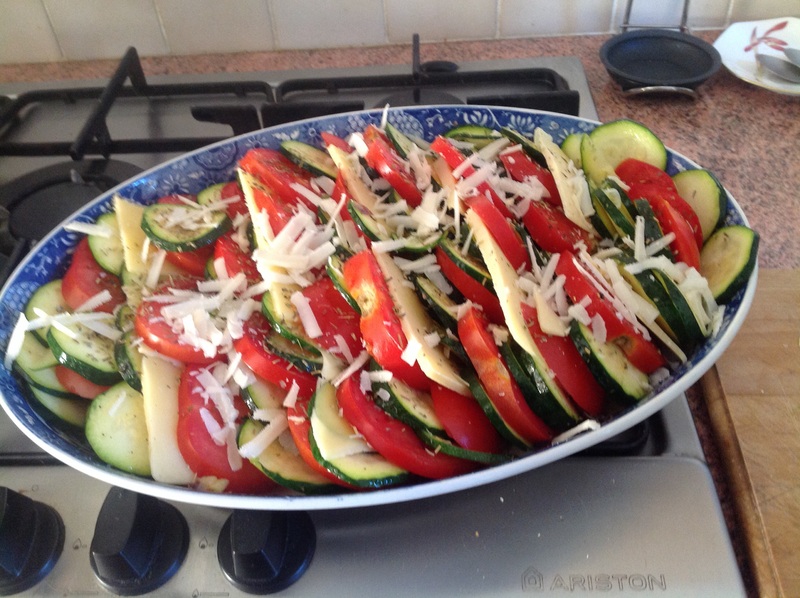 Cook for 15-20 minutes or until the courgettes are cooked. Chop the mint and lemon zest together. 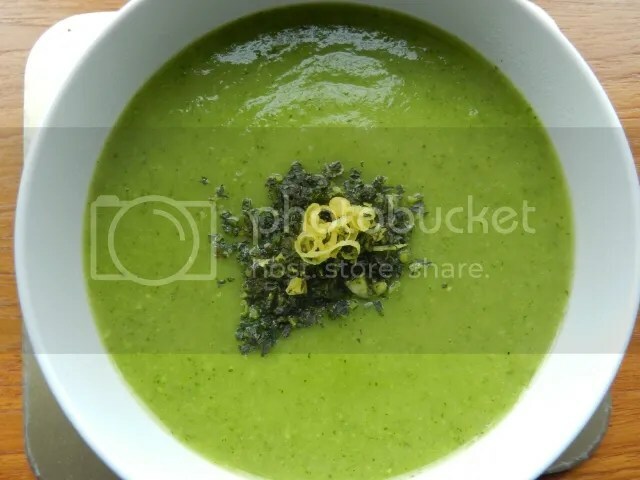 Serve the soup, hot or cold, sprinkled with the lemon and mint garnish.